Teenage Mutant Ninja Turtles Half-Shell Heroes: Blast to the Past Review – AiPT! Man, I am out of it. I consider myself a Teenage Mutant Ninja Turtles fan and yet I somehow had no idea that a one-hour TV special based on the Half-Shell Heroes spin-off toyline was on the way. It was so much easier to keep track of this sort of stuff when I was six. When hit by the strange energies of a powerful meteorite, the Ninja Turtles and their foes, Bebop and Rocksteady, are accidentally warped back to the Cretaceous period. Now stuck in the age of the dinosaurs, getting home will the least of the TMNT’s worries when the evil alien Triceratons show up to conquer a defenseless prehistoric Earth. 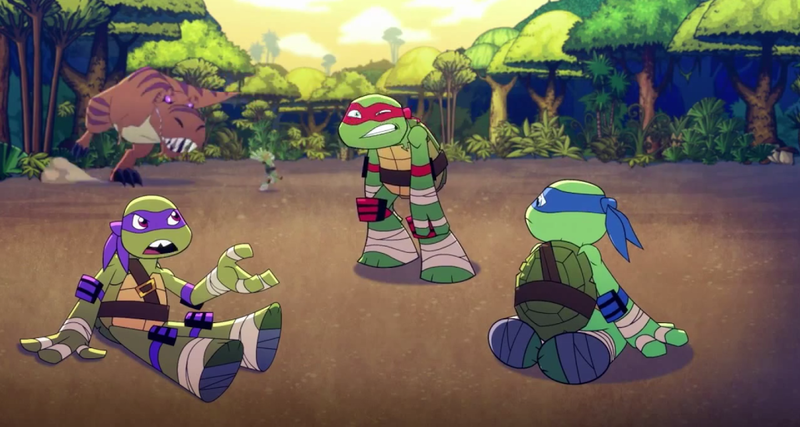 Airing this November, Half-Shell Heroes: Blast to the Past is a more kid-friendly off-shoot of Nickelodeon’s 2012 TMNT animated series, basing its aesthetic on the spin-off toyline of the same name. The one where the Turtles are “super deformed” and “cuter” with less accessories that toddlers could choke to death on. The animation is also in a traditional 2-D format, as opposed to the TV show’s 3-D CGI treatment, giving this special a unique visual appeal. Being aimed at a younger audience than the CG TV series, all the characters and situations are much less grim. Everything’s played for laughs and although there are plenty of action sequences, it’s a bit more of a slapstick/visual comedy routine than the bone-crunching brutality of the CG series. Characters like the Triceratons, who are portrayed as nigh-invincible juggernauts in the CG show, are dumb pushovers in this movie. Likewise, Bebop and Rocksteady are more in tune with their ‘80s counterparts, being played squarely for jokes than as challenging foes. But that isn’t to say there’s anything wrong with the approach. The comedy is pretty on point and all the actors from the CG series reprise their parts for the special. They play their characters roughly the same, though the script’s preference for goofy humor naturally colors their performances a tad differently. Again, I point to Bebop and Rocksteady, who are stupid but worthy opponents in the CG show, but rendered as braindead comedy relief in this cartoon. The plot is fairly predictable stuff, but fun for what it is. The Turtles all make their own dinosaur friends who team up with them to stop the Triceratons. The idea of the dinosaur partners is actually a bafflingly obscure reference to the old Cave Turtles toyline from the vintage TMNT series based on the ’87 cartoon. The Turtles are all paired with the same dinosaur buddies they had in the old line and the dinos even wear little color-coordinated bandanas, just like their old action figures. A strange thing to reference, but I dig the effort. And speaking of the ’87 series, the special’s focus on humor and lighter tone, along with the ever-present Bebop and Rocksteady, really gave me flashbacks to the old cartoon. The opening sequence sees Tiger Claw, Bebop and Rocksteady trying to rob a museum and the dynamic between the three was straight out of the ‘80s series, with Tiger Claw substituting for Shredder (Nick’s Shredder is much too serious to suffer the antics of Bebop and Rocksteady). Now, on the subject of the Nickelodeon cartoon, I’m not sure how or if this special shares any serious continuity with that show. The Turtles and the Triceratons are already familiar with each other, and since the Triceratons didn’t show up until the tail end of the third season, that would presumably put this special sometime after or during the fourth season (whenever the Turtles get back from Dimension X; season 4 just started broadcasting so I don’t know when that’ll be). Really, though, this was a silly toy-based special for younger audiences, so it probably isn’t meant to be taken too seriously in the grand scheme of the CG show’s canon. While the Turtles teaming with dinos is something we’ve gotten in practically every incarnation of the brand (going all the way back to the Mirage comics), what’s special is the animation. Courtesy of Titmouse and done in what looks to be Flash or Toon Boom or something similar, it’s very vibrant, clean and rarely stiff. There’s a lot of kinetic movement with the characters, employing smears and squash-stretch, and it doesn’t look nearly as static as some of the screenshots floating around make it out to be. There are a lot of over-the-top sight gags and much of the comedy comes strictly from the animation-itself and all the physical humor involved (like when Raph gets carried away by the pteranodon). Art design is from Derrick Wyatt, though I wouldn’t have believed it had I not read his name in the credits. It looks nothing like his other shows (Transformers Animated, Scooby-Doo: Mystery Incorporated, Ben 10 Omniverse) and I guess that has to do with him working within the established aesthetic of the Half-Shell Heroes toyline rather than going with his own personal style. That said, going back and looking at some of the Triceratons (such as General Zera), you can sort of see some traces of his pencil. Now, I’m about to enter spoiler country, so look away if that bothers you. The special ends on a cliffhanger, so it looks like we’ll be getting at least one sequel. Honestly, I sort of hope this thing spins off into its own sister series to the CG show, sort of like how the older-skewed Transformers: Prime was flanked by the preschool-oriented Transformers: Rescue Bots. It’d make a nice bit of content to fill the void for when the CG series inevitably goes into half-year-long hiatuses every couple of episodes (honestly, that show’s almost as bad about hiatuses as Gravity Falls). All in all, I liked Half-Shell Heroes: Blast to the Past. It probably won’t knock anybody’s socks off, but I think smaller kids will enjoy the heck out of it and older fans may find the 2-D animation to be a breath of fresh air. Fans of Bebop and Rocksteady or the Triceratons might also want to give it a shot.